Big update news from Adobe! A long-awaited update to Captivate, now at version 9, AND a new LMS product – Captivate Prime. I new this LMS was coming but assumed it would be an extension or adaptation of Adobe Connect, so was surprised to see Captivate Prime and not Connect Prime. Looks like Adobe has put significant effort into this LMS product, building it from scratch (?) as opposed to sticking a new UI or plugin on to their mature Connect platform. An actual Effects module with the selected effects visible on the master timeline! No more swapping between views to see if your effects line-up with the selected element! That was such an annoyance and big time waster. An update Captivate’s Objects panel allows you to convert any element into a multi-state object! Great news for those not as strong with Advanced Actions (and perhaps a response to Storyline’s superior object features). Other features include a ‘workflow optimizations’ such as a ‘Preview in SCORM Cloud’ to test how your project will integrate with various SCORM-compliant LMS products – including, of course, Captivate Prime. This has been a common troubleshooting suggestion, “Doesn’t work in your LMS? Try it in SCORM Cloud.” so it makes sense to just include that as part of the product…plus, Captivate already uses Rustici’s SCORM anyway, so you know they should work seamlessly. Additionally, Captivate continues to provide access to stock images, with over “25,000+ assets and customizable interactions” (I assume these are the eLearning Brothers stock, but have yet to verify). And a new ‘Draft App’ to enable storyboarding on mobile devices…well, maybe only iPads at the moment. I’m not sure how useful this will be…why make it an App? And, of course, improvements to Responsive Design capabilities Captivate offers, which is a HUGE advantage over competing products in this space, the most significant of which seems to be the option to adding additional ‘breakpoints’ to allow for a larger variety of screens sizes. Fortunately, you can preview the project to check how your courses look on those various screens too. Captivate 9 remains available for both Windows and Mac platforms (see system requirements). Now, Captivate Prime (CPPr? )… I’ve not seen this product yet and have a lot to explore. The only negative I’ve seen so far (that I find troubling) is lack of support for xAPI. 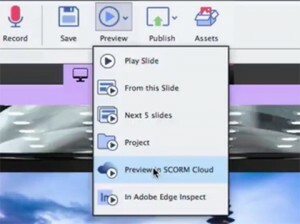 SCORM is there, and the now-deprecated AICC is there (!?) but no xAPI? Hmph. Perhaps that’s in store for version 2…I hope. On the other hand, CPPr does include an offline player, allowing you to access your courses when not online and sync-up when you are. That being one of the primary benefits of xAPI…perhaps there’s not as much a need to include it. Otherwise, Captivate Prime is plainly targeted for organizational training. Not B2B. Not B2C (well, maybe), and definitely not to the education space. However, it does include a few heralded gamifcation features, such as Leaderboards and Badges. There’s been a LOT of noise around those two elements for a while now, so it’ll be interesting to see how well they’re integrated, and how useful they really are. Read more about the product on the Captivate Blog – there’s far more there than I can pretend to know about this product yet.